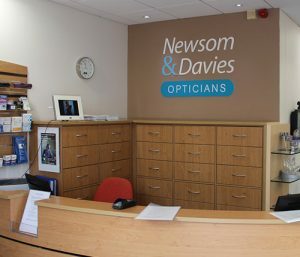 Having been established as Independent Opticians since 1977, Newsom & Davies have been looking after generations of families for over 40 years in the Bristol area. 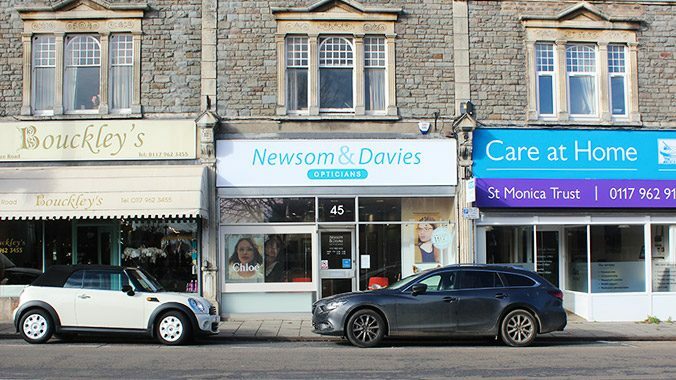 Conveniently situated in the Henleaze shopping centre they are dedicated to providing you with professional eye-care and quality products delivered by friendly qualified optometrists. Nina and Ruth, the founding partners, have supported “Visual Aid Overseas” for many years. The charity collects unwanted specs for re-use in developing countries and the practice is a drop off point. Having undergone a recently completed refurbishment of the practice, it was decided that a sparkling new visual image was required. The partners approached and appointed award winning Capitol Signs to re-design their external & internal sign imagery. They were delighted with our design concepts and the results, created by utilising a Matt Artic White background fascia panel, then applying the new two tone Blue corporate text at a large size, neatly finished off with a crisp white Ali frame. To celebrate their 40th year anniversary we created a large etched window graphic. And to help further promote the practice we topped off the external signage with a projecting sign. To welcome customers old & new we designed and produced a 3D wall graphic to sit directly behind the reception desk, all in the new corporate style and colours.